Mon., June 18, 2018, 5:55 a.m.
Tri-City 11, Salem-Keizer 0: Mason House and Tre Carter hit solo home runs and the visiting Dust Devils (1-2) routed the Volcanoes (2-1). Cole Bellinger (1-0) tossed five innings of three-hit ball with two walks and four strikeouts. Vancouver 6, Eugene 4: McGregory Contreras hit a pair of home runs, including an insurance marker in the ninth inning, and the visiting Canadians (1-2) defeated the Emeralds (2-1). Gustavo Polanco went 2 for 4 for Eugene, including a double and triple, and drove in two. 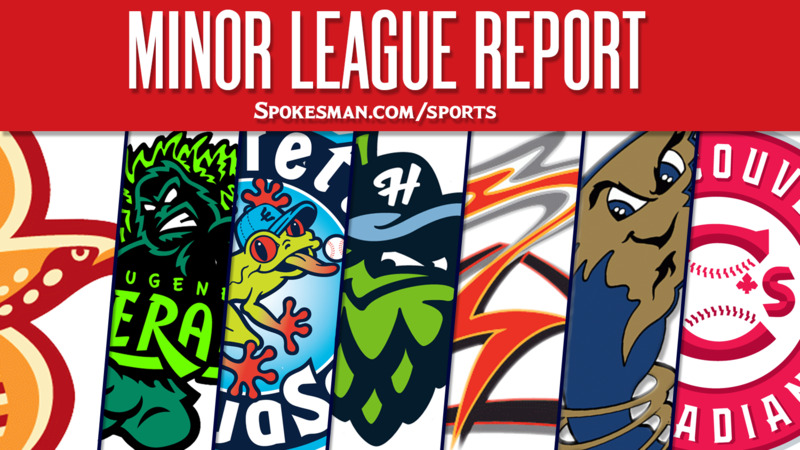 Hillsboro 3, Everett 2: Tra’mayne Holmes hit a run-scoring double in the eighth inning to help the visiting Hops (3-0) edge the AquaSox (0-3). Everett’s Connor Kopach went 3 for 5 with a solo home run. Fresno 6, Round Rock 1: J.D. Davis went 2 for 4 with two RBIs and the visiting Grizzlies (42-27) topped the Express (30-39). Tommy Joseph blasted a solo homer for Round Rock, while Elvis Andrus went 0 for 2 with two walks on an MLB rehab assignment from Texas. Midland 8, Frisco 1: Jesus Luzardo tossed five shutout innings on three hits and two walks and the RockHounds (33-35) handled the visiting RoughRiders (23-46). Josh Morgan went 2 for 3 and Michael De Leon drove in a run for Frisco. Frederick 4, Down East 3: Daniel Fajardo hit a walk-off homer in the ninth inning and the Keys (35-34) edged the visiting Wood Ducks (35-35). Josh Altmann homered for Down East, a two-run shot in the first. Lakewood 4, Hickory 0: David Parkinson struck out 11 over seven three-hit innings and the BlueClaws (30-38) blanked the visiting Crawdads (41-28). Jake Scheiner went 2 for 4 with a solo home run for Lakewood. One day after picking up his first MLB hit, former Indians catcher Jose Trevino delivered a pinch-hit two-run walk-off single in the ninth inning to lift the Texas Rangers over the Colorado Rockies 13-12. Published: June 18, 2018, 5:55 a.m.